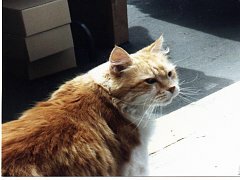 Clarence is the most popular cat in Canada. 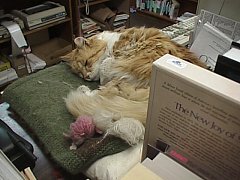 He lives in Sidney, BC at Tanners Books. He showed up one day, from where no one knows, and proceeded to take over Beacon Street. 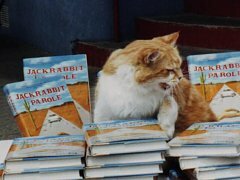 He made his rounds in the town every day, making sure all of his friends got the chance to pet him and feed him. People kept trying to persuade him not to sunbathe in the middle of the road, and to take up residence someplace in town. Finally, after two years in Sidney, he decided it was time to settle down. He chose Tanners as his home and stayed. 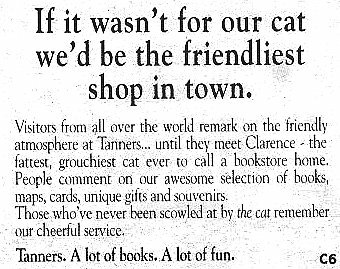 He is a bit of a grouch, so Tanners ran this ad. 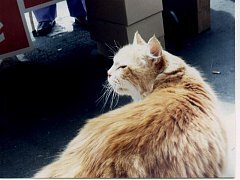 Three of these pictures were taken in 1991 when Clarence was still pretty lively. The first one on the bottom was taken in 1998, at age 23. Note: Clarence died in April of 1998 at 23 years old. He will be missed by many admirers and friends.